The third edition of the Open IoT Challenge officially started one week ago. 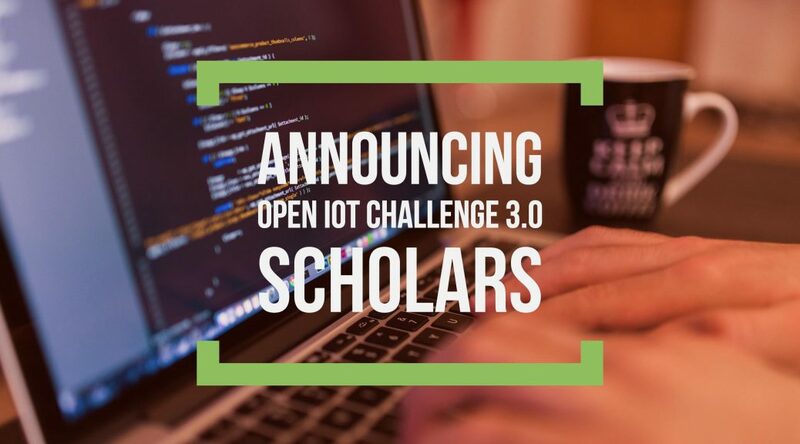 More than 80 teams have submitted their entries and are now in the running to win the Open IoT Challenge 3.0! Participants have about three months to complete their solution and show the world how open source and open standards can help build innovative IoT solutions. On February 27, they will have to submit their final project report and hope that their work ends up in the top 3 winning solutions. For now, the judges have reviewed all submissions and we have awarded a “starter kit” to the most promising solutions. We hope this will help them bootstrap their project. The kit comes in the form of $150 gift card to buy IoT hardware, as well as access to special offers from our sponsors. As you see, all the submissions have very specific use cases in mind, and I’m really looking forward to seeing the solutions that will be built. If you entered the challenge and your name does not come up in this list, it doesn’t mean you’re out – not at all! There were only so many entries we could select (and you may have noticed we selected more than initially planned), and unfortunately we had to draw a line somewhere. If you haven’t been awarded the “starter kit”, we still very much hope you will work on the project you’ve submitted. All the participants will be sharing their journey on their blogs and on social media, so stay tuned to see what they will be up to! I will also be relaying some of the cool stuff being built on Twitter as well, of course. My project was not selected, does it means that I am out of the iot challenge ?